Invasive Lobular Breast Cancer (ILC or ILBC) is an understudied subtype of breast cancer that affects 26,000-34,000 women in the US annually. There is increasing evidence that it has unique molecular, etiological and clinical features that deserve further studies with the goal to improve prevention, diagnosis, and treatment. Towards this goal, 130 researchers, clinicians and advocates from around the world met on September 29-30, 2016, at the UPMC Hillman Cancer Center. The keynote lectures were delivered by Dr. Patrick Derksen (University Medical Centre, Utrecht, Netherlands) and Dr. Mitch Dowsett (Royal Marsden, London, UK), and presentations centered around Epidemiology and Genetics, Pathology, Imaging, Unique Biology of Primary and Metastatic ILC, LCIS, and on Preclinical Studies and Therapeutics. For more information, view the agenda and abstracts as well as the slide presentations. Meeting organizers are forming a taskforce to identify the most important action items and next steps, as well as the 2nd International ILC Symposium to be held in 2018. Patient advocates from around the country, hosted by Heather Hillier, of the Pittsburgh Breast Cancer Research Advocacy Group (bcRAN), played an important role in the organization of the meeting. A Q&A session with the breast cancer advocates was held on the evening of the first day of the meeting. A Lobular Breast Cancer Patient Advocacy Group formed after the symposium with the goal to elevate lobular breast cancer as a distinct cancer that requires refinements in screening, patient care, enhancements in patient and provider education and substantive measures to accelerate research. A “White Paper” written by patient advocates in attendance highlighted needs and opportunities to increase our knowledge about this unique breast cancer subtype and improve all aspects of this disease, from diagnosis through treatment to follow-up care. Patients with Lobular Breast Cancer can join a closed Facebook Group “Lobular Breast Cancer (ILC) Invasive Lobular Breast Cancer” to learn about opportunities to get involved in Lobular Breast Cancer Advocacy, see updates on current research, ask questions and communicate with other patients with Lobular Breast Cancer. Participate in Lobular Breast Cancer patient discussions here. View a Lobular Breast Cancer Q&A with Dr. Rachel Jankowitz that was published in TribLive from the First Symposium. View the SHARE Webinar: Invasive Lobular Carcinoma — Highlights from the First Ever ILC Symposium. ASCO Collective Wisdom: Lobular Carcinoma of the Breast 2016 Education Book. 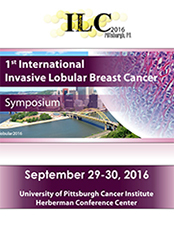 View the 2016 ILC Symposium brochure. View the 2016 ILC Symposium photo gallery. View the 2016 ILC Symposium blog by Margaret Flowers, PhD, Associate Director, Grants and Scientific Communications at BCRF. Contact the Invasive Lobular Breast Cancer Advocacy Group to learn how you can help advance lobular breast cancer research, screening, treatment and follow-up care at: ilcpatientadvocacy@gmail.com.